Riki Senn uses an abundance of local produce to bring bright sweetness to this recipe. 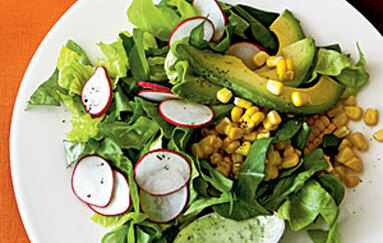 The cool creaminess of a Hass avocado is the perfect addition to temper the spicy bite from the radishes and add extra flavor and texture. Combine sliced avocado and juice in a small bowl; cover and refrigerate. Trim both ends of corn cobs, leaving husks from corn intact. Place the corn on a baking sheet. Bake at 450° for 20 minutes or until tender. Cool. Remove husks from corn; scrub silks from corn. Cut kernels from ears of corn; discard cobs.